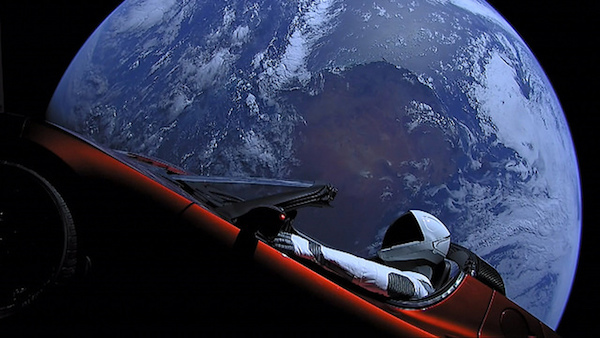 It’s been close to nine months since Elon Musk and SpaceX launched their mannequin ‘Starman’, dressed in a SpaceX astronaut suit and placed inside Tesla’s ‘Roadster’, into the galaxy as part of SpaceX’s ‘Falcon Heavy’ rocket launch. This second line pays homage to author Douglas Adam’s second novel, The Restaurant at the End of the Universe, from his five-part series Hitchhiker’s Guide to the Galaxy. Based on SpaceX’s diagram, ‘Starman’ and its Tesla will loop back to eventually arrive as close to the Sun as Earth is. The mannequin and its ride would, however, likely remain in lonely orbit for thousands, or even millions, of years. You can track the progress of ‘Starman’ and its Tesla ‘Roadster’ on whereisroadster.com, which was created by the founder of Old Ham Media, Ben Pearson.